I know what you're going to say. "No Josh, the best Greek yogurt is _____." Oh, let me come clean right now and let you know that this is Josh typing this post. Wait, don't go! I know what you're thinking, Josh never writes posts on the family blog. Well just so you know that is simply not true. I write posts all the time, like back in 2011 I wrote a really good one (What? Two words don't count?). And in 2010 I wrote like five and even a couple in 2009. I know what you're thinking, what about 2012? Well after all my hard work on the blog, I was taking a hiatus that year, but don't worry, I'm back in business now... Alright, you're right I never write. It's almost like seeing a unicorn, so consider yourself lucky. So back to my post. 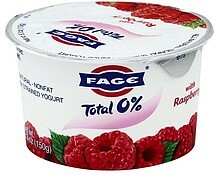 The best Greek yogurt by far is FAGE (pronounced “fa-yeh”), and this is coming from a one time Greek yogurt hater. I wanted to like it (Greek yogurt), I really did. With all its amazing health qualities I was excited to try it and add it into my daily diet. But every kind I would try just wasn't as good as my ol' Yoplait. In fact I never wanted to finish the thing. The texture was weird, the taste was different and nothing about it made me want to eat it except maybe the sugar. But then Adele bought these FAGE yogurts from Costco, and she would never stop talking about them. "Mmm, these are so good." She would say while shaking her head with joy. "Wow, this was amazing." Her eyes would be closed dreaming of a cloud made of FAGE yogurt. "Josh you should try one." She would say while looking at my growing gut. "Oh Josh these are the best things ever made ever." Is close to what she'd say like every day (or something like that). After these comments I would look at her, then back at the the 0% number on the container and just smile and nod and say, "Maybe later." About 0% fat foods. I don't like them. When we get frozen yogurt on our hot dates together I choose my flavor by picking the only one that isn't fat free, usually when I'm lucky there is at least one. I didn't think I'd ever try this FAGE Greek yogurt out. I don't know what it was, but finally the day came where I was "in the mood" to try one of these yogurts. I was afraid I might take one bite and want to trash the rest. That's what happened with the last kind I tried. I took a raspberry out of the fridge, opened it up, and took a spoonful of the yogurt and dipped it in the raspberry sauce and then took a bite. I was like, "That's not bad I don't think. Perhaps that was a fluke. Let's try another one." I tried another one then another and soon it was all gone. I wasn't in love when I was done, but I wasn't in hate either. I could do this. Now, I love it enough to come out of blog post hiatus to tell the world. There is a science behind not having the fruit mixed in the Greek yogurt until right when you want to eat it. FAGE did it on purpose saying it is better for Greek yogurt when you do that, and it must be true. The texture of FAGE is just so much better than the rest. All the rest are no good (and yes that includes Chobani). Buy FAGE Greek yogurt. It is the best! P.S. Yes I know it isn't Christmas anymore. And Yes, it is my fault the banner is still in the Christmas spirit. I was going to work on it, but then I wrote this wonderful post instead. Yes, I know you would have rather had me replace the header image. Next time. I promise(ish). Next time. :) Welcome to the blog Josh! Your lovely wife is doing a fabulous job of keeping us all in the loop in your absence. Thanks to Adele's first post, I got brave enough to try Greek yogurt again and I admit... it was not love at first bite, but it grew on me and now I am eating it every day for breakfast. Thank you for convincing me to give it another shot... and yes, Fage is by far my favorite! Only two stores here carry it and I can only find the strawberry and honey, but now all I want is to try raspberry! Adele said she gets it at Costco, but ours only carries the large containers, not the fruit included individual ones. Bummer. Oh ALRIGHT! I guess I'll try it. I will be sitting here, waiting, breathlessly for the new header Josh. I like this post but do you like the yogurt without the fruit mixed in?